I have learned over the years that one of the best indictors of a successful and more peaceful school year begins with quality summer planning and preparing. There are a few things I do over the summer that makes the Foundations side of our school day run well, and I share them with you in case they might help you have more sanity than chaos this school year. The Classical Conversations Foundations program is centered around Memory Work – memorizing a LOT of things – lists, sentences, timelines. At the beginning of the year, this seems like no big deal. But as the weeks pile on, it can start to feel a bit overwhelming if you aren’t keeping up. In addition, the papers for my Essentials kids (4th-6th grade) get longer and more complex, so Mom starts focusing more time with the older kids and the younger ones can tend to get the leftovers. 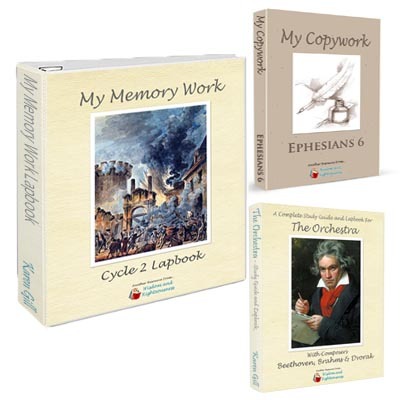 Having an organized system for Memory Work and fun resources for them to use makes the school year easier. In addition, our family chooses to add some extra memory work into our year, and this system makes it easy to do so. There are three parts to this system – the File Folders, the Playlists, and the Bookshelf. 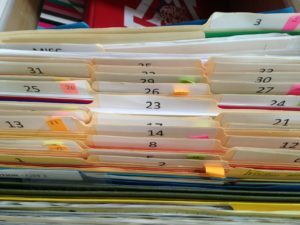 The first thing I do is to get a box of file folders and label them 1-36. (I seriously LOVE having a label maker for school!) I choose 36 because we aim to have 36 weeks of school, but the Foundations Program is only 24 weeks, so you may wish to label yours 1-24. (If you notice, there are post-it flags on the file folders with a different number – that is the CC week). I keep mine in a file drawer right next to my computer desk, but this expandable folder with 24 slots would be perfect as well! 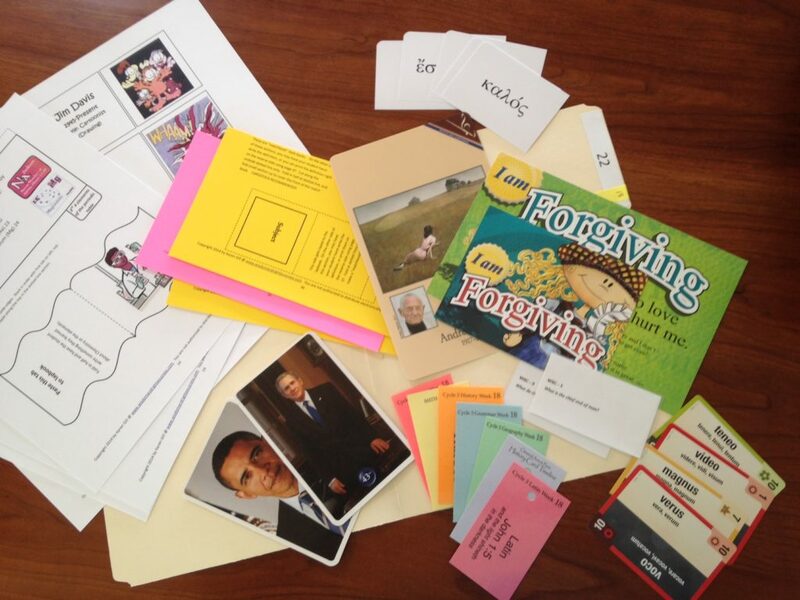 Once I have my folders labeled, I take the Foundations Memory Work Cards, and toss them into the corresponding folder. For us this year, we start our CC Foundations week on week 4 of our school year, so I will put all the memory work cards for week one in the folder labeled 4, memory work for week 2 goes in folder 5, and so on. So I end up with week 24 memory work in the folder labeled 28 (if you only have 24 weeks, just put them in 1-24). I do the same thing with our My Memory Work Lapbook pieces. After printing out the lapbook pages for the whole year, I segregate the pieces by the week it is introduced (if more than one week is on a page, I just quickly rough-cut the page to separate them). This way, I am ready to hand out the memory work lap books pieces at the beginning of the correct week, without any planning during the year. It makes it so easy! Since I have multiple kiddos, I print off multiple copies because they all like to make their own book. 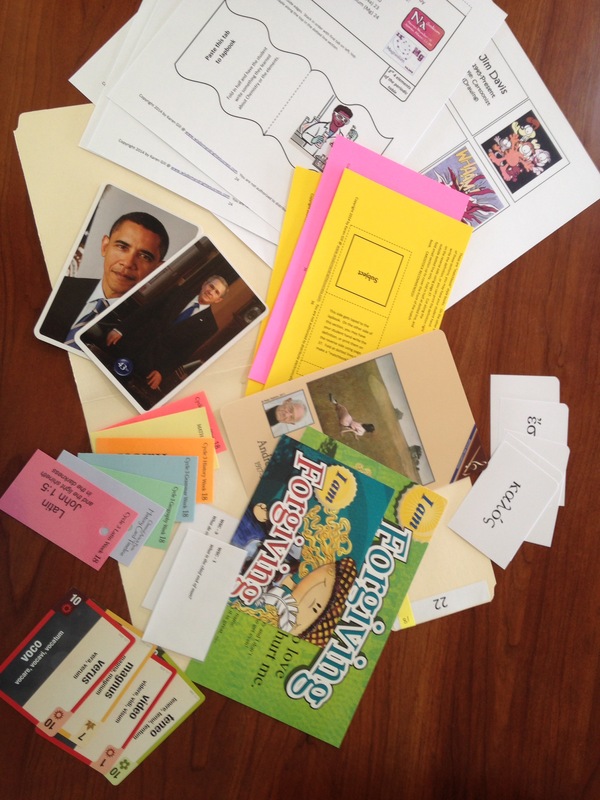 But you could just segregate the pieces among your students and complete one book as a family to have an interactive-“scrapbook” of all of your memory work for the year! The best part is you can continue to use it week-after-week to review the memory work as you learn it. 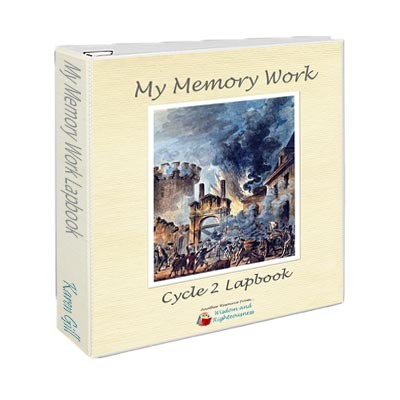 In addition to the My Memory Work Lapbooks, we like to add some extra memory work. You can read more about that in THIS POST. The second thing we do that really makes it easy for us to absorb all of this memory work, is to use music. I already wrote about how God hard-wired our brains to memorize easily by music, and I have found this unbelievably true for our family. Using the same idea as the file-folder system, I make week-by-week playlists of all of our memory work. So when we start our school day on week 10, we have Week 10 memory work playing in the background all throughout our day. It also syncs with my phone, so I can play it in the car just by selecting a particular week. Since I have kids who like to do Memory Masters, we can also easily start reviewing the final weeks long before they are introduced. I download music off of CC Connected for every piece of CC memory work, and most of our extra memory work has music as well. Finally, I set up a bookshelf system. 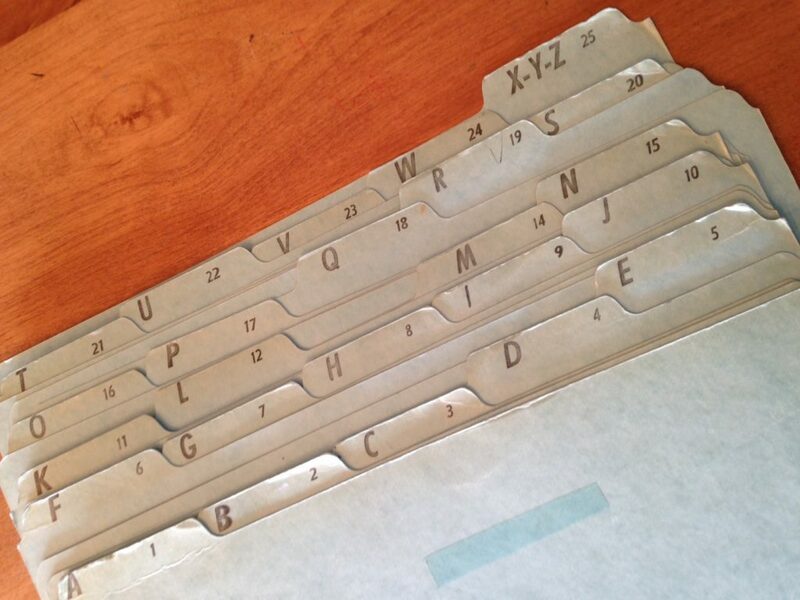 I just use file-divider tabs like this (see the small #’s 1-25? ), to create sections on my bookshelf, and place the books we want to use according to the week we use them. 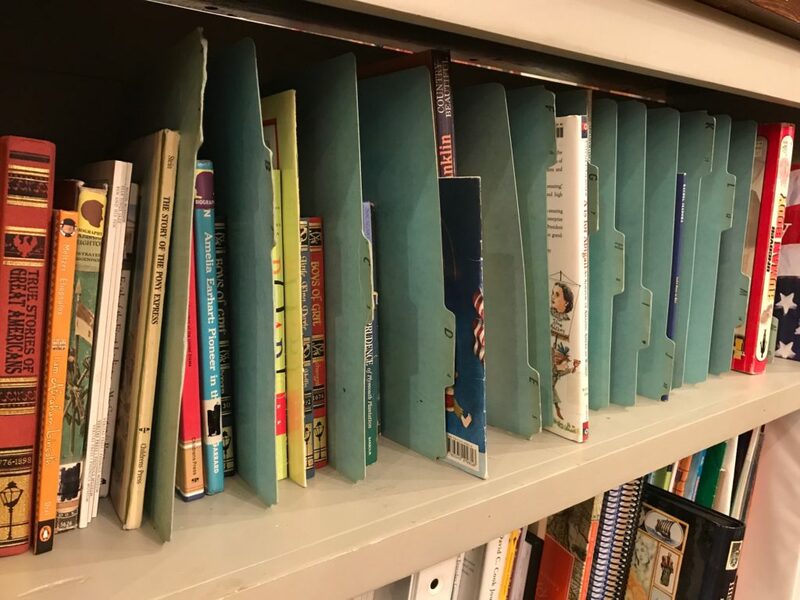 The File-Folder, Playlist and Bookshelf system, makes our Foundations year super-simple, all because of a little summer planning. If I don’t set this up before school starts, we could never do a great job with our memory work, and I would feel a little stressed. Ok, so a LOT more stressed. I started using this system four years ago, and continue to do so. I hope some ideas here bless your year. I’d love to hear of any tips or tricks that you find priceless to your school planning! I was involved with CC for 5 years, but once my daughter was in Challenge we found we wanted more for high school. 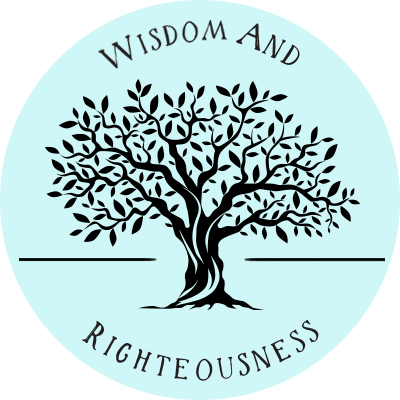 I found an amazing online classical Christian school called Wilson Hill Academy. The classes are live and the teachers are amazing! Thanks for sharing your system. I love getting new ideas from other people. How do you have your music set up? I created playlists on Windows Media Player with all of my CCC music and do it week by week. I’m curious if you use the same thing, because I would love to sync it to my phone. And actually I’m now running into a problem transferring the playlists between computers. I spent a ton of time setting up the playlists, but haven’t figured out how to get that to work yet. Anyway, just thought I’d see if you have any “techie advice” on that. Thanks! I currently use iTunes, though I am not a huge fan in the way files are managed on iTunes. You can sync a Playlist on Windows Media Player to a device too though. Here is an article I found that might help: http://www.pcworld.com/article/223275/sync_android_windows_media_player.html Hope this helps! Do you read books that go along with CC? I need a plan for that too! I love your planning ideas.